For the Mayan civilization, water represented the entrance to Xibalba, another dimension where only the bravest can enter. You can now enter this world by confronting the mythical legends of the Mayan civilization sliding through the nine levels of adventure. Xibalba, the Mayan underworld: Slide down at full speed on a waterslide of 59 ft. of height to reach this dwelling place of darkness only the bravest dare to enter. Chaac, Lord of the storm: Use a mat to go down these waterslides competing against your friends to defeat Chaac, the Mayan deity of rain and water that holds in his hands the power of thunder. Kisim, Lord of the underworld: Defeat this powerful lord by sliding like a bolide from the top of the Great Pyramid. At 78 ft. of height, you will need a strong spirit to jump! Unab-Kú and Itzamná, Lords of creation: The Mayan gods of universal creation protect you while you slide down these two serpent waterslides. A nice ride falling from a height of 40 ft.
Balam, Jaguar god of darkness: A twilight being who travels through the sky is now here to help you beat the evil. 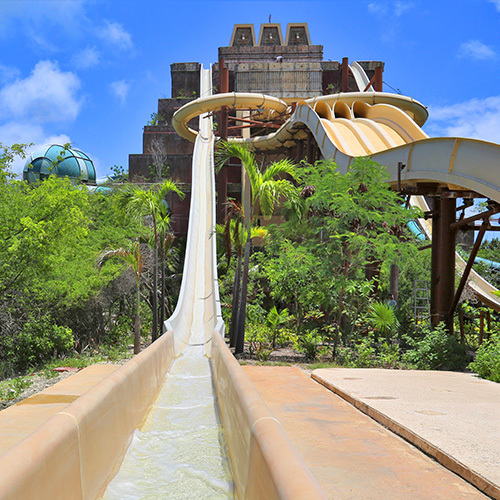 Absorb its powers sliding from the highest point of this waterslide located at 40 ft.
Yum Kimil, Lord of the death: Don´t let the of Xibalba deceive you! He will make you think you have reached the Xibalba only to struck you into wild water again. Its highest point is at 40 ft, but you must pass through its 3 levels to reach the light. Jurakán: Lord of wind and storm: His great flood might destroy the will of an ordinary man, but those who dare to go through its furious eye, will receive its power. Xtabay, Goddess of sin: The most dangerous character will be waiting to bewitch you at 78 ft. of height, on the top of the Great Pyramid. Escape from her maleficent powers sliding down at full speed, then go back to the top of the pyramid to face her again!